In late 2015 Conductor Paula Nava Madrigal and Concertmaster Teo Benson founded the Ballard Civic Orchestra with support from a City of Seattle Neighborhood Matching Fund grant. In the three years since then, BCO has performed over two dozen concerts throughout the city and King County, receiving grants from the City of Seattle Neighborhood Matching Fund, Latino Community Fund, 4Culture Foundation, and Seattle Peoples Fund. In addition, it has supported the growth and success of its affiliated World Youth Orchestra program. Special performances and celebrations of Latinx cultural traditions, such as Dia des Muertos and Las Posadas, have included music by Latinx composers, performed by Latinx guest artists. The Consulate of Mexico in Seattle has supported BCO programs and guest performers, especially its concerts at the Ballard Locks on Mexico’s Independence Day in September. In 2017 KCTS produced a documentary about Paula Nava Madrigal entitled “Breaking Down Barriers” which has been viewed nationwide. The 2018-19 BCO concert series is entitled “Music as a Bridge to Intercultural Understanding” and includes a side-by-side concert with Seattle Symphony at the Highline Performing Arts Center on February 14, 2019. 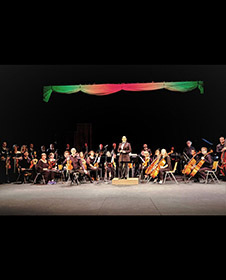 The mission of the Ballard Civic Orchestra is to enhance community life by using music as a bridge to intercultural understanding in Seattle. BCO offers classical music education, opportunities, and experiences, without charge, in diverse neighborhoods and venues citywide. BCO is a multi-generational orchestra of professional musicians, talented volunteers, and enthusiastic music lovers who want to share their passion for music in a way that benefits their communities’ working families, young professionals, youth, and retirees. A special focus of the Ballard Civic Orchestra is under-served Latinx youth, their families, and communities. The successful World Youth Orchestra program, an important affiliated project organized by Young Strings Project Outreach and supported by Ballard Civic Orchestra, provides beginning and continuing instrumental and orchestral instruction by professional teaching artists, without charge, at Casa Latina on Saturday afternoons from 2pm-5pm and at Sunset Hill Community Center on Monday evenings from 5pm-6:30pm.